Opae ula live in anchialine pools like this. A small red shrimp from Hawaii is becoming increasingly popular as an aquarium pet. This is the opae ula shrimp or halocaridina rubra. In the Hawaiian language, opae ula literally means red shrimp. One can mostly find them in Hawaii’s anchialine pools. Anchialine pools are small landlocked bodies of water with a subterranean connection to the ocean. 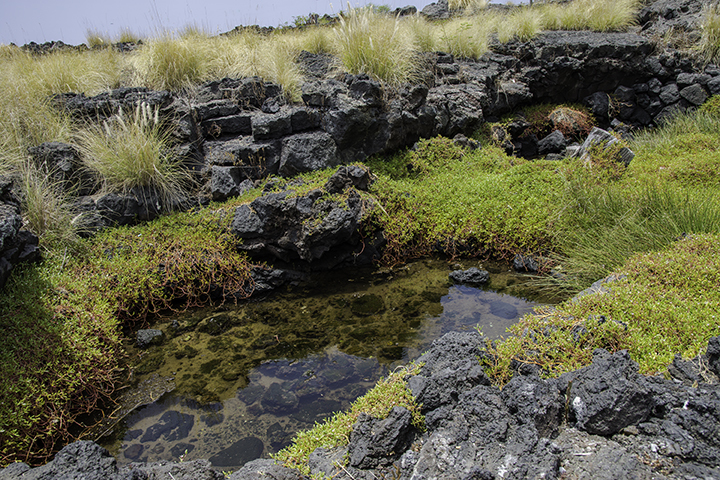 In addition to their link to the ocean, many anchialine pools have a freshwater source. And as a result, the water in these pools is often brackish. Anchialine pools are relatively rare. You can typically only find them in coastal areas of made out of limestone or in areas with relatively young lava fields. Hawaii, and in particular the Big Island, has many young lava fields. So this is the reason why Hawaii has the most anchialine pools on the planet. Opae ula shrimp are endemic to Hawaii‘s anchialine pools. This means they exist nowhere else in the world. These small shrimp, typically about a half inch in length, and are able to withstand wide ranges in water salinity and temperatures. Moreover, opae ula can survive by eating the microorganisms commonly found in anchialine pools. Such organisms include algae, plankton, bacteria, and diatoms. This ability to survive in harsh surroundings enables the opae ula to live up to 20 years in captivity. This is a key factor in its growing worldwide popularity as a pet. A small, but growing, industry in Hawaii has developed. This industry raises, markets and exports opae ula to aquarium enthusiasts throughout the world. Some have even created opae ula shrimp eco-systems in a wide range of glass encasings. In the past, many of Hawaii’s anchialine ponds were in pristine condition. The pools were abundant with red-colored opae ula. So much so, that the waters of many anchialine ponds were red. There were so abundant that ancient Hawaiians once used opae ula as to feed fish in their fishponds. But today, urban development, pollution or non-native species are threatening these pools. Scientists estimate that such threats have damaged over 90% of Hawaii’s anchialine pools in one form or another. There are regulations that protect the opae ula shrimp. They prohibit its sale without a commercial fishing license. And they also require reporting of daily catches and identification of purchasers’ names. It is also illegal to collect and sell coral, sand, and rock that the opae ula live on. However, some say the State needs better enforce regulations to protect the opae ula and its unique environment.